Holographic storage is a mass storage technology that uses three-dimensional holographic images to enable more information to be stored in a much smaller space. 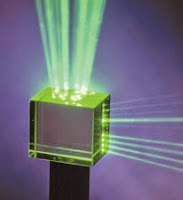 The technology uses holograms which are created when a light from a single laser beam is split into two beams; the signal beam (which carries the data) and the reference beam. In holographic storage, at the point where the reference beam and the data carrying signal beam intersect, the hologram is recorded in the light sensitive storage medium. Storage Capacity: Magnetic and traditional optical data storage use points of a particular recording surface to store information linearly. On the other hand, holographic storage stores data in three dimensions on the recording medium. This essentially allows a larger amount of information to be stored on a smaller space. Storage Size: As more data can be stored on a smaller area holographic memory promises to dramatically reduce the amount of space needed to store vast amounts of data. This has significant consequences for both industry-grade and consumer mass-storage devices. Longevity: Holographic memory allows a user to write something to disc and have it be stable for up to 50 years. Magnetic storage degrades over time, and mechanical issues can lead to the failure of the disk itself. Magnetic storage requires contact between a reader and the recording surface which usually results in breakdown in about five years. On the other hand, holographic storage requires no points of direct contact, but instead uses lasers. Faster Data Retrieval: Holographic data storage also allows for faster data retrieval as memory is stored multi-dimensionally rather than linearly (this allows multiple points to be accessed simultaneously). For this reason holographic data storage allows transfer speeds of up to 1 GB per second. Holographic systems are able to do this as they retrieve whole pages of data, roughly 60,000 bits of data, with a single pulse of light whereas more traditional storage mediums such as DVDs can only transfer one bit of data per pulse. Extremely useful for medical archiving. (magnetic storage devices typically have storage life of 5 years). Extremely optimum for small portable devices because of low power consumption (10GB/Watt) and high data storage capacity. Current data storage options on the market such as ‘Blu-ray’ disks can compete with projected storage capacities of holographic data storage. This make companies less eager to invest in holographic data storage if current technologies can compete. There are already emerging storage devices such as 3D optical data storage, similar to to holography but can store more data, specifically up to petabytes ( 1000 TB ) of data. Here we have uploaded Holographic Data Storage Seminar PPT. All you need to do is just click on the download link and get it.